Although the majority of my gigs are steampunk-centric, I consider myself an artist without an adjective. Sure, my work appeals to steampunks, and for that I am most grateful, but I have performed at everything from Punk (as in "three chords") shows with 16 year-olds; to swanky private parties for Hollywood celebrities (Brigette Fonda, Danny Elfmen, as well as the recently-departed Jack Klugman, among others). One of my favourite gigs, ever, was singing outside, at night, on the sidewalk at this really lame Santa Village called "Winter Wonderland" just off Hollywood Boulevard, the first Christmas I lived in LA, ten years ago. It was like 38 degrees out and what few people there were walking by, were not paying any attention to my music. The guy in the sound booth kept playing the wrong backing tracks, and all-in-all, it was a train wreck. But instead of getting upset, I decided to go with it. I had nothing to lose by experimenting, so on a lark, I decided to sing everything for the rest of my set, in a French accent. It felt good. Really, really good. So I did it again the following week, at my first paid gig in LA, and it worked so well that I haven't stopped being French since. I'm still very humbled and grateful to the steampunks for so graciously welcoming La Moi into their midst. 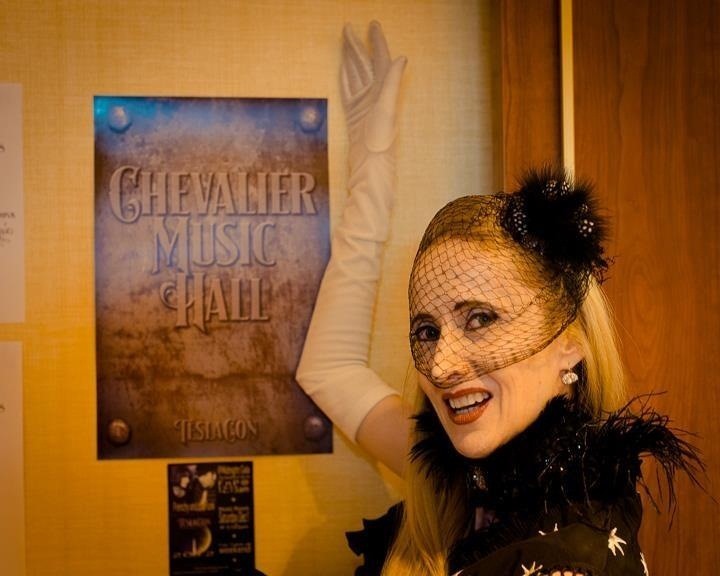 If the defining moment of my performing career was that night in Hollywood, then the highlight of my steampunk career, thus far, is having Lord Bobbins III (aka Eric Jon Larson), the Founder of TeslaCon, name the cabaret at his 2012 event after me, as depicted in the photo. I won't rest on my laurels though. An artist is nothing without that sense of experimentation. I have a number of new projects in gestation, and look forward to sharing them with my dear fellow steampunks, and anyone else who'd care to join us. (FYI- I really was born in France, and my mother really is French, but my father was American. I grew up traveling the world due to his career as a broadcast journalist in The U.S. Armed Forces Radio & Televistion Network). Wow, what great information! I didn't know most of those things about you, Veronique, so that was a very fun and interesting read.